If you are considering adopting a pet, a cat might be a good choice. Cats are independent and require a relatively small amount of care. They also offer affection to their owners and can provide amusement through their actions and natural curiosity. 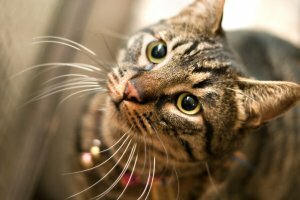 The tips in this section can help you care for your cat and keep him or her happy. You'll find some ideas to make giving medicine to your cat easier, keeping cats of the counter, and preventing your cat from falling out of an open window. The following articles are available for the 'Cats' topic. Click the article''s title (shown in bold) to see the associated article. Cats move quickly, and sometimes it's hard for you to be quick enough to catch them. In that case, you need to have a couple of tactics to catch your cat quickly in the event of an emergency. Have you ever noticed how you can almost always tell when you enter a house that has a cat? While it may be nice to think that this is because of the little fuzzy feline that is wandering around, it is generally due to the smell that comes from a cat relieving themselves. Cleaning cat litter properly can go a long way to helping eliminate that odor. The trick is to do it the right way. Cats can sometimes be hard to train, and may often behave in ways you don't want them to. By using a few squirts of water, you can better train your cat to do what you want it to. Giving any animal medicine is not a fun job, and you need to know the ins and outs of such procedures. Giving your cat medicine may not seem the most enticing of activities, but if done correctly, you can ease up the process, and get it over with quick. It can be quite difficult to give medication to your cat and they are generally more resistant than dogs. There are two methods that work best for giving your cat medication. You can hide the medication in your cat's food, or you can orally insert the medication. If you have a cat, chances are you have cat litter for your cat. Cat litter is understandably a little disgusting, and you definitely want to keep it out of your kitchen. Here are a few ways to do that and keep the litter training intact. You may like cats, and you may like reclining chairs, but you shouldn't mix the two. Cats and reclining chairs is a set up for disaster, and that disaster could end up seriously injuring your cat. You may not have thought of talcum powder as dangerous, but for your cat it can be. Try and keep talcum powder away from your cat and keep it safe! Your pets may be a part of the family, but they do need boundaries, and as a pet owner, that is part of your responsibility. For the safety of your pets and your family's health, keep the pets off of the countertops. While cats are pretty easy going pets, there should be certain restraints and restrictions you implement. Cats don't need access to every part of your home, and so you should know how to keep cats away from certain areas in your home. You may be caught somewhere with your cat and you don't have any cat toys. If your cat gets bored, that could be a problem for you and your cat. Here's how to improvise a toy out of a film canister that will result in a win-win situation! A cat's life can't be too bad, but as a pet owner you want to maximize the quality of life for your cat. Here are just a few suggestions to improve the already cushy life of your precious cat! Traveling with pets is never too much fun, but there are ways you can reduce the stress. You should pack a little litter tray when traveling with your cat, so you can get reduce that stress of being on the road! Mothballs may be helpful in protecting your clothes from the ravages of moths during the summer and winter, but mothballs aren't good for much else. Protect your cat's health by keeping your cat away from mothballs. Quickly catching cats is something of a misnomer, and more of a practice in relativity. What this means is that catching a cat quickly is only quick when compared to something else, such as the oncoming ice age. That being said, there are a few things that you can do to help speed things along a bit. If you're a major pet person, it's definitely a possibility that you have both a cat and a bird. This could be a problem. Learn how to stop your cat from attacking your birds, so you can better enjoy both pets! Cats aren't dumb animals, and are usually pretty good at figuring things out. However, if they get lazy and tired, falling asleep in front of an open window could spell out a recipe for disaster. Make sure that your cat is safe and away from any open windows. Cats have a tendency to find and enjoy warm places for relaxation. However, you should watch out for some of these places for yours and your cat's safety.